This entry was posted on Friday, July 31st, 2015 at 2:06 pm	and tagged with birds, cell phones, mourning doves, nest, tweets and posted in education, figure of speech, humor, phrasing, student writing, word choice. You can follow any responses to this entry through the RSS 2.0 feed. I’m guessing your student was probably aiming at the more common expression of being “on the phone”. The “sit” was an unfortunate addition, though. I wouldn’t be surprised if their parents frequently yelled at them “Are you going to sit on that phone all night?” Maybe it’s related somehow to the New Yorker expression “stand on line”? By the way, in my native tongue, Afrikaans, the expression “sit on the phone” is quite common (used figuratively, of course) and naturally migrated to English as well, though I doubt that’s the case here. Very interesting. I WISH I could say my student had lived in South Africa, but alas…. At first glance I wondered if the essay was about college girls at a bar with their phones in back pockets – who can talk with that music level…body language would be important…oh, and texts, so phones not in pockets for long. Word sloppiness and confusion seems to be rewriting word definitions.How will I keep up and avoid being confused and using the wrong meaning which used to be the right meaning? Need some soothing dove therapy. 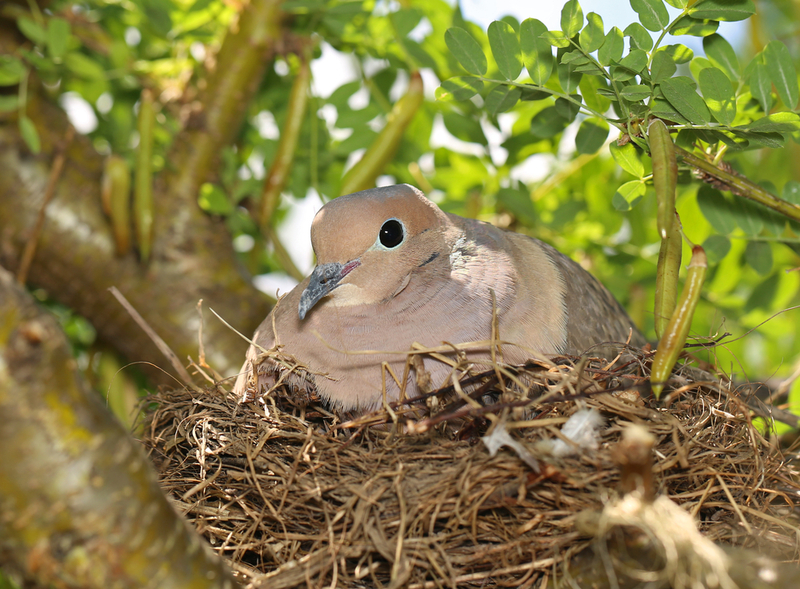 Come to my house; the dove will look calmly at you, and her spouse will Whoo-OO at you from the nearby shrub, and you will feel peace! We have a lovely neighborhood flock, too. Not sure where they nested this year, but the small ones came to the sheltered lantana bush area for dinner and flight school. We actually saw one land, swing upside down on the branch and hang there looking totally confused for a bit. It’s the best show going, isn’t it? It is. We had to take down the feeder. There’s plenty of food right now with the fig tree, the palm dates, the lantana, the veggie gardens…But mainly because it began to feel like we were setting up a buffet for hawks with so many of the doves sitting in a straight line all along the fence right across a clear flyway. They are better off foraging in the bushes. HArder to spot, but still cooing. Right you are. In our yard, too, the bird feeder seems to be in danger of becoming the hawk-feeder…. We clap and yell, but at least one of the hawks who sometimes drop by is not at all fazed–there’s actually a look of condescending contempt in his eye, I believe! We try to fill the feeder at hours when no hawks have yet chosen to visit. Luckily, we also have some faithful blue jays who are excellent hawk alarms, and all the birds listen to them! So glad you enjoyed it. Yes, at one campus where I used to teach there was a pond that attracted many species of ducks and wading birds. I commented one morning on that, and the students seemed surprised 1) that there were birds and 2) that I cared. So I said I would give extra credit to anyone who came to class in the next week with the names of three species of any birds at the pond. No one made the effort! And the world is so full of wonders. Nice to hear from you! This is so true! It makes me think of my life, and how I should certainly prioritise my time instead of whiling away my time. A lot more people like you need to awaken the youth! Thank you! I spend too much time on my computer, too. But a lot of my students tell me they are NOT COMFORTABLE speaking with one another face-to-face; they would rather text. That I find very scary. So much is said without words by the tone of voice, the expression in the eyes, the touch of the hand….they’re giving all that up. We have to fight that! It does seem to have a life of its own, doesn’t it? I’m glad you’re enjoying it. And I’m an English teacher too–maybe we’re all alike?